Dear Jeff, thank you for continually publishing The Vision…. I believe I was converted as a young child at a VBS. My parents were not Christians and never went to church but would send the 8 of us children off to VBS when they could find someone to invite us. I was called, however, when I was 33 by special invitation of the Holy Spirit to return to church. Anyway, my first 15 years in an SBC church I never tithed my salary, because I struggled even to pay my bills. I gave to the church but only when there was extra money to give. Long story short, when God opened my eyes to the doctrines of grace I felt the need to tithe no matter what my situation at the end of the week. Now I don’t believe in the prosperity gospel that the heretics push in today’s media, but I have found the old saying true: “You can’t out give the Lord.” The largest benefit I have received is the relationship I have gained with the Holy Spirit. I give to the Lord’s work first no matter what condition I find myself in. Several years ago I visited a church in North Carolina which I had attended over a period of ten years while on vacation. The pastor was preaching on tithing. He argued that the New Testament did not teach tithing as a requirement or standard. He said one should give what is laid on his heart. It might be 0% or 90%. I could not argue with his findings. Having said that, I have found that the Old Testament tithe fits me well. 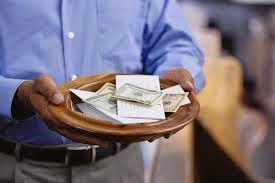 My “offerings” [above and beyond the tithe] I give outside the church to organizations like the Institute for Creation Research, to Christian schools, or to people whom I feel might need it. Thanks for sharing this. I am inspired!